UPDATED: Thu., Dec. 7, 2017, 9:51 p.m.
ATLANTA – With the season potentially hanging in the balance, Deion Jones leaped high in the air, about as high as he could go. He reached even higher, snatching the ball away before it could reach the intended target. Holding on for dear life with both arms, the Atlanta Falcons linebacker landed flat on his back in the end zone, the ball secured tightly against his chest. No way he was letting go. Jones made a leaping interception in the end zone with 1:25 remaining and the Falcons held on for a crucial 20-17 victory over the New Orleans Saints on Thursday night, setting up a three-way race for the NFC South title. Matt Ryan shook off three interceptions to guide the Falcons to Matt Bryant’s 52-yard field goal with 3:49 to go. The Saints (9-4) were in position to pull out the victory, driving to the Atlanta 11 after Drew Brees converted on fourth-and-1 with a quarterback sneak, as coach Sean Payton passed on attempting a tying field goal. On second down, Brees attempted to hit tight end Josh Hill in the back of the end zone. The Falcons (8-5) climbed within one game of the division-leading Saints with three weeks to go, as New Orleans squandered a chance to build a three-game lead on the defending division champs. Atlanta is back in the race and gets another crack at New Orleans when the teams meet again in the next-to-last week of the regular season at the Superdome. The Carolina Panthers (8-4) also are right in the thick of things. Ryan had three interceptions in a stretch of nine plays at the end of the first half and the beginning of the second. But he tied the game with an 8-yard touchdown pass to Mohamed Sanu with 9:55 remaining , finishing 15 of 27 for 221 yards. Brees was 26 of 35 for 271 yards and two TDs. Yet he was kicking himself for trying to force one at the end. On the opening possession, New Orleans lost half of its dynamic 1-2 punch in the backfield when rookie Alvin Kamara took a shot to the helmet and staggered off with a concussion. Mark Ingram was left to carry the load as the “Boom and Zoom” duo became simply “Boom.” He was held to 49 yards on 12 carries as the Saints largely abandoned one of the league’s top rushing attacks. Michael Thomas had 10 catches for 117 yards and a TD . With Atlanta trying to drive into position for a tiebreaking field goal in the waning seconds of the opening half, Ryan threw a terrible pass that was picked off by rookie Marshon Lattimore, who was back in the lineup after missing two games with an ankle injury. Lattimore returned it 33 yards to the Atlanta 29 with 4 seconds remaining, setting up Wil Lutz to boot a 47-yard field goal as time expired. 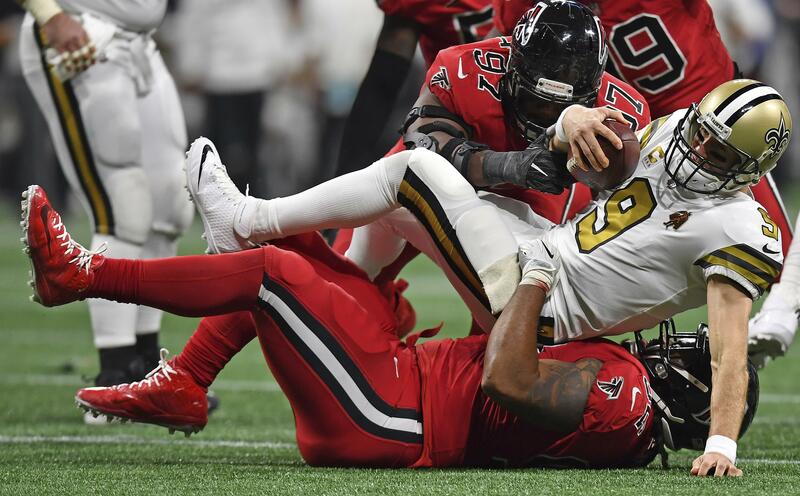 But the Falcons caught a break when the Saints failed to have seven blocked on the line of scrimmage, and the penalty resulted in a mandatory 10-second runoff that ended the half with the score tied at 10. After getting picked off on Atlanta’s last play of the first half, Ryan went to the air again on the first play of the second half. Same result, though it wasn’t Ryan’s fault. The ball went through the arms of tight end Austin Hooper, rolled up on his back and was intercepted by Chris Banjo, setting up the 1-yard scoring pass to Thomas. On Atlanta’s next possession, Ryan guided the Falcons to the New Orleans 9. On third down, he attempted to force a pass into the end zone for Julio Jones only to be picked off again by Marcus Williams. It was the second time this season and ninth time in his career that Ryan has thrown three interceptions in a game. It was a brutal night for the Saints, which is sure to raise more questions after the health risks of playing on Thursday nights. In addition to Kamara’s injury, New Orleans lost another offensive guard and three starters on defense. Guard Senio Kelemete, filling in for injured starter Andrus Peat (groin), left with a concussion. That forced the Saints to go with Josh LeRibeus, the backup center. On defense, the Saints lost linebacker A.J. Klein in the first half with a groin injury. Starting defensive end Trey Hendrickson left with an ankle injury and strong safety Kenny Vaccaro was sidelined with a groin injury. Saints: Host the New York Jets (5-7) on Dec. 17 in the first of two straight home games. Falcons: After a short turnaround for the Thursday night game, Atlanta has an 11-day break before returning to action with a Monday night contest at Tampa Bay (4-8) on Dec. 18. Published: Dec. 7, 2017, 8:34 p.m. Updated: Dec. 7, 2017, 9:51 p.m.